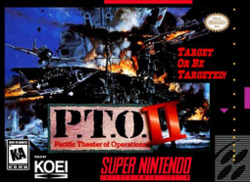 PTO 2 for Super Nintendo has you engage in three major campaigns or participate in 10 short scenarios. Either way, you can set your conditions for victory and take command of forces from 70 strategic bases from around the world. While you're engaged in battle, choose from a wide variety of weapons including 120 warships, 60 planes, 20 submarines, and 10 tanks.